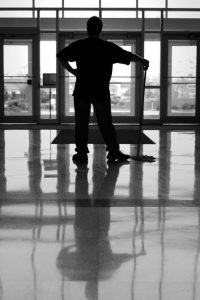 When it comes to workplace housekeeping, the term incorporates much more than simply cleaning, dusting, and mopping. Workplace housekeeping encompasses offices, factories, warehouses, and other manufacturing and distribution facilities. Good lighting is essential for commercial facilities. Therefore, the light fixtures ought to be cleaned regularly so that the accumulated dust doesn’t affect the quality of light intensity in the room. Improper lighting has an impact on the performance of the workforce and also makes the place appear dingy. Effective housekeeping involves floor and surface maintenance. The walls and the floors ought to be cleaned with perfection. If there are any oil, grease, or liquid spillages, then these must be cleaned immediately to prevent hazards from occurring. Warning signs must be placed if there are any spillages to make people aware. The walls should be painted in light color and the floors should be skid resistant. The plumbing, electrical, and other utility systems should work efficiently. The doors and windows of the building must be stable. One of the basic elements of good housekeeping is to check that the tools and equipment are functional. Inspection of tools should be done periodically in order to detect faulty equipment. Well-maintained tools and machinery prevent accidents from happening. Tools and equipment mist also be stored properly and should also have appropriate labels. Most people trip over the stairways because of unnecessary clutter. Therefore, theses should always be kept clean and no object should be place in between that obstructs the path. Likewise, the aisles should be kept clean so that the movement between them is safe. Mirrors must be placed in blind corners so that no unforeseen injury takes place. A kempt storage space is a necessary element of good housekeeping. The packages must be stored on a solid base. The products must be secured in the storage areas properly so that they do not fall over. All hazardous products that can cause fore or any other catastrophe should be stored separately. Waste management is also an important element of workplace housekeeping. The waste should be disposed off in a proper manner as suggested by the regulatory bodies. Extra Hands Services, Inc. provides excellent janitorial and housekeeping services to various companies. We provide floor waxing and sealing solutions that enhance the aesthetic appeal of the flooring as well as optimize the functionality. If want a customized cleaning service devised exclusively for your company call us at 816-994-8825and talk to our commercial cleaning experts.